Hi, I’m Alexander, founder of Free Write Camp whose mission is to make people writing excellent. I encourage people like you to start writing when you feel that writing can serve you well. I’m neither forcing people to write nor am I evangelizing. I mean you who wants to be a known writer but didn’t dare to express it or acknowledge it for yourself. I’m almost in the same boat as you. I do write for money as a freelancer (blog posts, promotional texts, copywriting, guides and research-intense pieces) but I also have three day jobs to sustain myself. At one day job I’m writing for an online community, at another one, I’m cleaning households. The third one is where I cold-sell to potential clients and do content marketing (plus copywriting) from time to time to sell better and more. You said „screenplay“ above, what happened to it? Good question. I’m educated in the field of media and computing. As part of my Master’s thesis (2013), I decided to get away from the computer and make a film: my first short film that you can watch online for free. I wrote the screenplay, casted the actors, directed the film together with my cameraman and did everything a super low-budget movie (4.000 EUR) required: making something out of not much. Film-making has been fascinating me for more than ten years. I bought books about it but never pursued it as a career. However, after having learned the foundational theory and practice of screenplay writing in my own film, I have an idea about it. I want to teach what I know and share what I learn. I’m not your know-it-all guru on screenplay writing. I’m Alexander who shares your enthusiasm for writing and film. 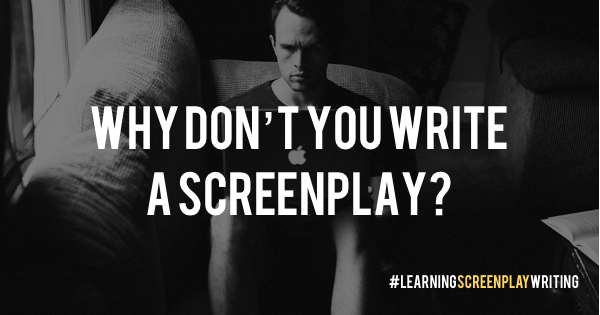 That’s why I call this series #LearningScreenplayWriting where I share my learning progress with you. Each weekday I’ll be reading books, articles and other things to help me become a screenplay writer. On the weekend, I’ll share what I learned and teach everything I know. Every week the amount is going to increase until a point until I have enough material to make a course out of it. You can follow my journey here or wait until the course on screenplay writing is going to be finished — around July 2017, although I wouldn’t bet my arm for it. What new have I learned this week, what did I notice? What will I continue working on? When? Where? How? What do I want to apply in the next few days? What do I want to make catch up on? What do I want to clarify? Honestly, I just started today with the learning journal on screenplay writing. I thought about sharing the arch-plot structure or some other relatively random piece of information. It would be valuable to me but it would be simply weird to start directly with a plot structure. Since I’m starting this journey in the public, learning in the public, iterating in the public and eventually correcting myself in the public I will want to start where a new learner of a topic does start: the basics. So, I’ll jump to the next question. Why is writing a screenplay not like writing a novel? How is it different? Do I need to write a screenplay at all? Can’t I make a film without? What’s the big deal with screenplay writing? Is it really that complicated? Can I become a millionaire writing screenplays only? How long does it take to write a screenplay? Are you a real writer when you only write screenplays? These are the ad-hoc questions that cross my mind. Starting tomorrow I’ll be answering them until next Saturday — each weekday after I finished my day-job duties. I’ll be searching online (Quora, Wikipedia, DuckDuckGo, etc.) and scan the books I have. Right now there’s not much I can apply. I thought about writing a screenplay on the fly (while learning and sharing here). I’m unsure if this is feasible or reasonable. My mania writer inside me tells me to just do it. My inner censor tells me to think about it for some more days. I would know which screenplay I chose. I’ll reveal the topic when I decided to do it. I want to catch up with why current knowledge status. I’m expecting a lot of aha moments and revelation because I dove into the topic of screenplay writing before. I’m looking forward to getting excited about it again. Screenplay writing is a special field. It’s demanding and requires a lot of attention and care. By no means am I professional with regard to writing screenplays. My lust, however, is to write great dialogues. I love dialogues and I know dialogues are the hardest element that you can screw up easily. If you want to see how I wrote dialogues, watch my first short film on YouTube or Vimeo. You’ll find English and Spanish subtitles to follow the originally German-speaking movie. I appreciate taking the time to read this article. See you next weekend with more learning pieces and revelations (and so much more questions). This was the first entry of my learning journal #LearningScreenplayWriting at the Free Write Camp. Every weekend I’m sharing what I learned during the week so I can teach you everything I know. Thanks, you read a publication for the Free Write Camp where you learn in tents. Currently, I’m building up the “Cinema Club” tent that teaches you to write excellent screenplays. Learn writing screenplays – for free!